The “Cup-Bearer.” Male figurine, Spedos variety (Early Cycladic II period, ca. 2600 BC). A leading Athens institution offers visitors insights into civilizations that thrived in the Aegean and the Eastern Mediterranean for millennia. 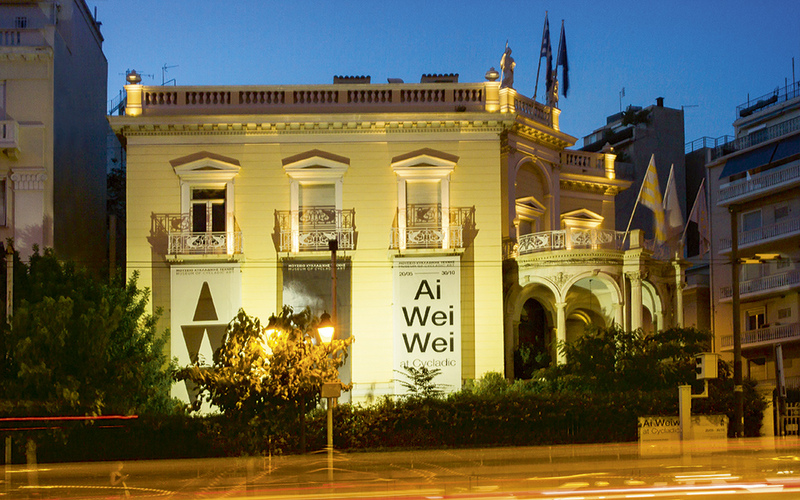 Every tourist anxious to rush through Athens and head to the Greek islands this summer should spend at least a few hours at the Museum of Cycladic Art. The visit will add depth, meaning and historical dimension to the usual routine of the holiday experience (sea – sun – horiatiki salad). On the four floors of that museum, we can all learn a lot, not only about the Cyclades and ancient art, but about ourselves. Let me explain: In my teens, I liked to doodle, drawing meanders, rhombuses and concentric triangles on any scrap of paper lying around. This aniconic art helped me pass the time as I chatted to my friends on the phone or was bored with life in general; it was, in short, an activity that literally saved me during that period of dissatisfaction and ennui, and I rediscovered it on the second floor of the Museum of Cycladic Art, right there in the middle of the 10th century BC Attic wine jugs. The lines I had drawn for years, my idle doodles, were there, decorating ancient vessels. Like my adolescence, the 10th century BC was predominantly a dark period, as commercial trade fell off markedly, art became largely decorative and the dead were buried with nothing more than bronze clasps holding their garments and modest burial gifts at their sides. As is the custom in life and in the passage of civilizations, after darkness comes light, and in the 9th century BC, society breathed once more: commerce picked up, ties were forged with the Phoenicians and the written word was reintroduced to the Aegean after a four-century hiatus. 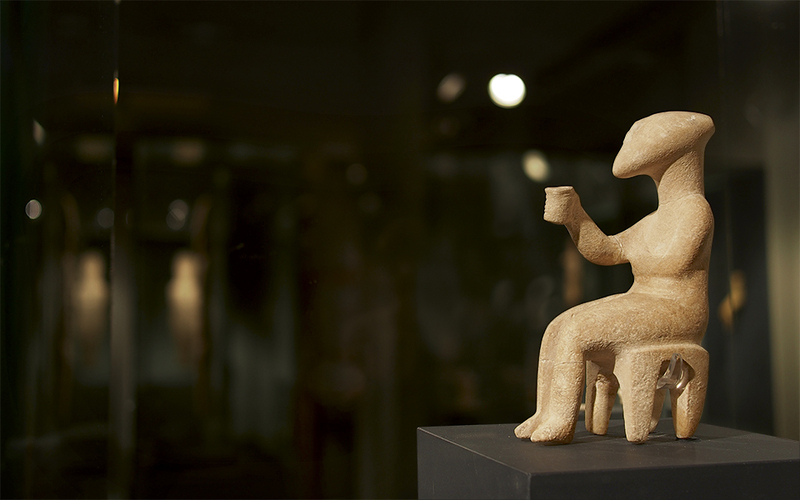 At the Museum of Cycladic Art, we witness these strides in history. The transitions are, if nothing else, comforting. All that ends, starts again, an incredibly encouraging thought during our current strange and dark period in Europe. 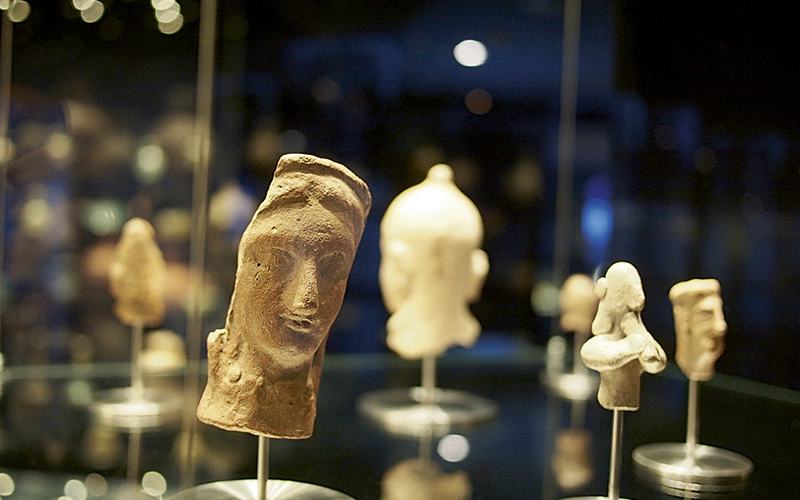 The Museum of Cycladic Art was founded 30 years ago, in 1986, by Dolly and Nikos Goulandris. It was a highly political initiative, a calculated response to the theft of antiquities that plagued the Cycladic islands in the 1950s and 60s. The elegant Stathatos Mansion, built in 1895 by architect Ernst Ziller for the Stathatos family of ship owners and national benefactors. During the 50s and 60s, the characteristic Cycladic figurines (also known as “idols”) – with their sculpted nose, right arm crossed under the left, the slightly bent knee and elevated heels – were sources of inspiration for Western European avant-garde painters and sculptors. Constantin Brancusi, Pablo Picasso, Henry Moore and Amedeo Modigliani viewed the Cycladic figure as the paradigm of modernism and minimalism. Naturally, this led to an ever-increasing interest in Early Cycladic art and, of course, a booming market. Peddlers who had previously referred to these idols as “dolls” and who had given them to children as toys were suddenly being offered staggering amounts for their wares; a thousand drachmas per inch of statue! The illegal excavations that followed resulted in the coordinated destruction of the Cyclades: a total of around 1,600 figurines were unearthed. If we consider that, on average, only one in 10 graves contained such items, we understand how many thousands of graves were pillaged during that time. Almost half the burial gifts were discovered in Kavos, on the uninhabited islet of Keros. Most were broken, and probably had been since ancient times. However, not all the idols were unearthed broken. Often, to hide them during transport, the smugglers themselves would break the figures into pieces and stash them in fruit crates! According to archaeologists, the spot on Keros may have been some kind of sanctuary, and it’s possible the statuary featured in some still unknown ritual. Today, we may be in awe of the “Keros Hoard,” but the sight of an entire hillside literally razed by looters was a deeply disturbing one for the archaeologists who first encountered it in 1963. They knew that, even if the figurines were recovered, valuable information regarding their discovery and initial use had been lost. It was in the midst of this, in 1962, that Dolly and Nikos Goulandris were granted their collector’s license and began repatriating Cycladic idols in a bid to stem the illegal export of antiquities. Over time, they built the biggest collection in the world. Today, some of the stars of that collection – violin-shaped female figures with incised pubic triangles and lined abdomens – are showcased on the first floor. Visitors will notice that not all of these idols look the same. Over time, some of the features evolved. Their heads became more almond-shaped, creases flanked their breasts and their legs were separated. Their form, however, remained largely unchanged over four whole centuries. Such marked conservatism is usually associated with religious art, so it’s possible the figures are of female deities that were worshipped in the Cyclades. If this hypothesis is true, then these women-violins are the first depictions of divine figures in Aegean art. Pyxis with lid, 760-750 BC. Pyxes were initially used to hold cosmetics or jewelry. 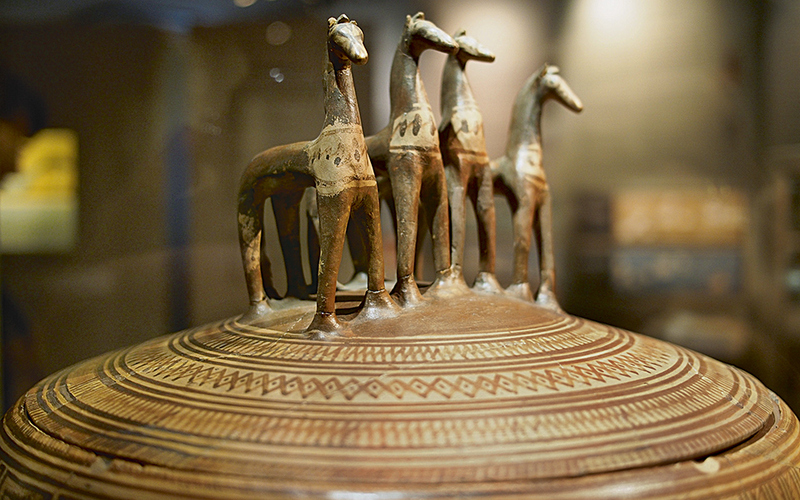 The Attic vessel is particularly ornate; its lid, shown here, is decorated with equine figures. The exhibition on the fourth floor offers visitors a new perspective on daily life in ancient Athens. The latest technology is used to showcase the exhibits to their fullest advantage. The second floor of the museum is dedicated to ancient Greek art, from the middle and late Bronze Age to Classical times (480-323 BC), and the Hellenistic and Roman eras through the 4th and 5th c. AD. Here we observe, again and again, how societies, their activities, the rise and fall of every civilization, are all instrumental to shaping the craftsmanship of each period, influencing form, subject matter and utility. From the much sought-after clay jars created by the prehistoric civilizations of Knossos and Mycenae to the more decorative art of those ancient Dark Ages, what is evident from all the finds displayed is that prosperity brought a penchant for luxury, even when it came to mundane objects. In contrast, periods of poverty, organized migration (i.e., during the colonization of Southern Italy) and the decline of trade are reflected in pieces that are more formulaic and utilitarian. In the Archaic period, city-states once more found themselves in a position to move forward and form the foundations of new institutions. They developed new laws, a system of writing, the concept of currency and armies of hoplites. At this point in history, we see the emergence of utilitarian art in war, such as the Corinthian helmet, worked from a single sheet of bronze. But war did not just mean new jobs in the ranks of the hoplites; it also meant violence and destruction. The casualties mounted, first from the Persian Wars and later from the wars between Athens and Sparta. Scenes of ceremonies in which the living usher the dead into the afterlife feature in funerary reliefs of this period. 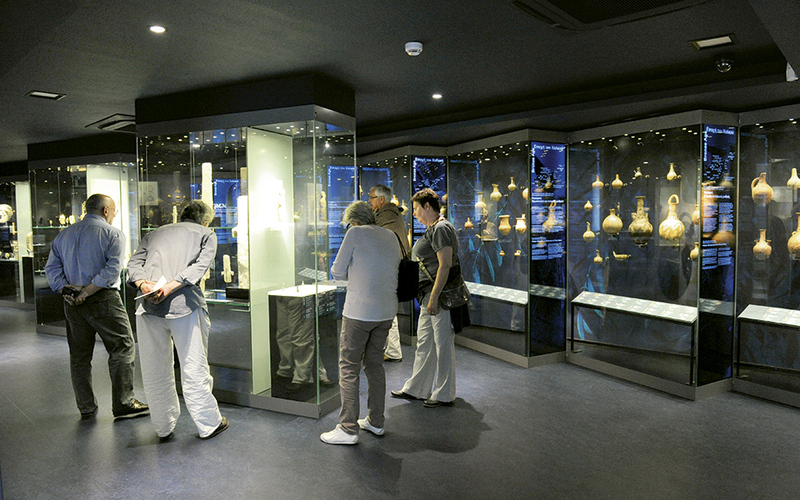 The Cypriot collection is one of the biggest outside of Cyprus and includes exhibits from the 4th millennium BC to Medieval times. In the 1st c. BC, glass became a star in its own right, thanks to technological advances that led to its mass production. It is also then, during the Hellenistic and Roman periods, that a centralized authority model gave an air of globalism to both social structures and art. Currency unions were established and Graeco-Roman traditions found themselves entangled with Oriental art. As a result, the earliest statues of Buddha clothe him in Greek robes! 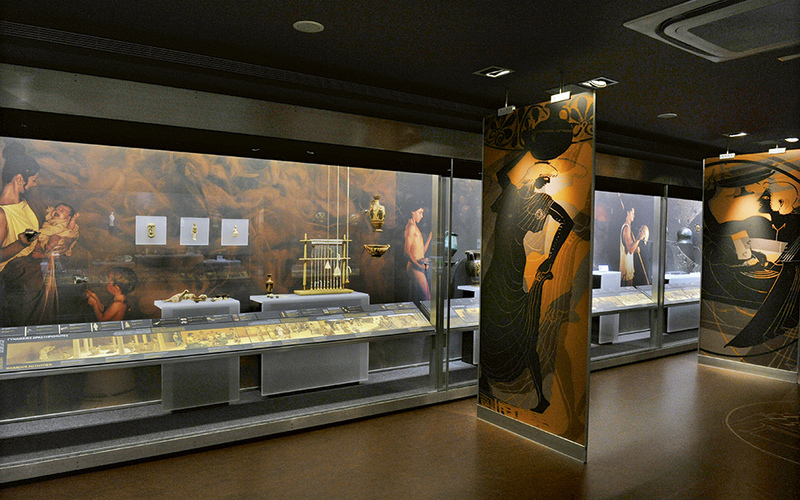 The museum’s third floor, completed four years ago, was given over to the Cypriot collector Thanos N. Zintilis so that he might display the most comprehensive collection of Cypriot art in the Hellenic world. The collection is a marvelous showcase highlighting the Hellenization of Cyprus by Greek settlers, who introduced both the Arcadian dialect and the paradigms of Aegean art to their new island home. Here, among other objects, we see the cross-shaped figures currently depicted on the €1 and €2 coins minted in Cyprus today. We also see a clay jug used to transport opium, the only pain killer available in ancient times. Here, too, is the splendid necklace from the tomb of Arsinoe – an exhibit item coveted by museums around the world – decorated with sapphires, emeralds and pearls, and showing clear Assyrian influences. It’s not all ancient on the third floor – modern technology has been put to good use here, as there are two interactive stations where you can learn a great deal about the history and art of the Mediterranean. The same is the case on the fourth floor, where 142 objects of ancient Greek art are used as educational material to create everyday scenes from daily life in ancient times: among the subjects are personal grooming habits, the marriage ritual, a regular day in the Agora, war and death. To help visitors identify easily with the people of ancient Greece, the museum takes us through the life of Leon, a fictional character born in 458 BC. We follow him from his childhood home to the palaestra, the wrestling school, all the way to his grave. This is an excellent way to familiarize children with the cycle of life as well as with Greek history. However, this is also an opportunity for the entire family to explore its new-found knowledge. Don’t miss the collection of children’s toys, such as the turtle rattle or the articulated dolls that heralded the modern marionette. Take a moment, too, to examine the black-glazed vessels and the impressive bronze basin with handles, probably used at symposiums for diners to wash their hands. Look for the Corinthian plate with the caricature of a naked man, something exceptionally rare in the Classical period, as well as the small amphorae with the cartoon-like drawings of swans, lion, geese and wild boar. Last but not least, check out the Minoan bird’s-nest cup made of marble and the stirrup jar or “false-neck amphora” with the spout. The MCA shop, offering a wide selection of design objects and stylish accessories inspired by Cycladic art, is located on the ground floor of the Main Building, at 4 Neophytou Douka St. It is open not only to museum visitors but to anyone interested in purchasing a gift or book. Make sure to conclude your visit with a stop at the Museum’s cool Cycladic Café, where juices, snacks, wine and light dishes are served. Every Thursday and Friday, the café hosts two special gastronomic experiences, “Aegean Cheese and Wine” and “Aegean Taste”, in association with Trip2Taste.